I have a cap I got from my grandfather many years ago but I can't find any pictures of this online. If anyone can tell me which country this cap 'belongs' to I would be greatful. This topic has been moved from "Collector's Community: Forum's Inn → The Collector's Inn" to "British & Commonwealth Armed Forces (1914-1945) → British Empire & Commonwealth: Clothing Headgear & Helmets". Hello! I moved your topic, believing the new location will provide experts an opportunity to comment and/or move it to the appropriate country/period section. 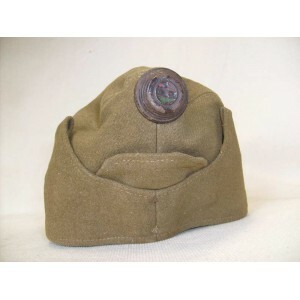 At the very least you will know if it is or not a British Armed Forces (1914-1945) piece of headgear. First: Welcome to the Forum, Erik! Second, I've have again moved it but now to the correct section. I asked around on our Forum's FB page and it turns out it is a Hungarian WWII cap. Could be however that it is "home-made" with the things attached. Waiting on more information. Hello my friend! Thank you for your assistance with identifying headgear posted by Erikcb, great work. Interestingly the cap itself appears to be acirca WWII British made FS cap, but the insignia obviously is not, so probably converted from a British cap to a Hungarian version, but when this was done is another question.